Warner Bros. has unveiled a new movie poster from director Zack Snyder’s Superman reboot, Man of Steel. To promote the release of The Dark Knight Rises on DVD and Blu-ray, Warner Bros. offered to unlock an ‘exclusive reward’ from Man of Steel for sharing the countdown. 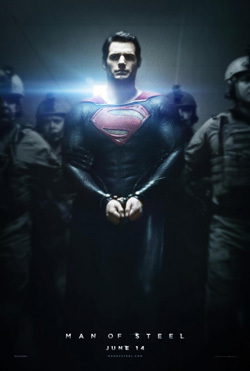 The ‘reward’ is a brand new poster featuring actor Henry Cavill as Superman being handcuffed and escorted by the military. “Man of Steel” stars Henry Cavill, Amy Adams, Michael Shannon, Kevin Costner, Diane Lane, Laurence Fishburne, Antje Traue, Ayelet Zurer, Christopher Meloni and Russell Crowe. Man of Steel will be presented in 3D, 2D, and IMAX and is slated for release on June 14, 2013. Click on the poster below for a larger version.